Best Injectors for LB7 Duramax Reviews: Top 4 in April 2019! Hi, I am Ken Coul, your online auto mechanic and social networking advisor. Today I had a hard time because I was asked to review the best injectors for LB7 Duramax, and honestly, there isn’t much leeway with this issue. There is one leading injector fabricator for this application, and that is Bosch. So, what I did was look at all the alternatives of a Bosch fuel injector, including new, refurbished and remanufactured. Guess what, there is a lot of stuff going on in the world, and there is a large selection that can make you take a bad decision. Just a quick note on the differences between the types of injectors you will find. Refurbished injectors are usually the cheapest option to buy. Refurbished means that the injector is used, and was removed from an engine, and was completely cleaned and tested for any integral damage, as well as meeting OEM performance requirements. Remanufactured injectors are parts that were used in an engine, but when removed were stripped down to their core elements rebuilt. The damaged parts were replaced with new parts, and as such, remanufactured injectors are more expensive than refurbished. They are also tested for OEM compliance. OEM Rebuilt injectors a are parts that have been used and stripped down like a remanufactured part, but all the components apart from the body have been replaced with new ones. 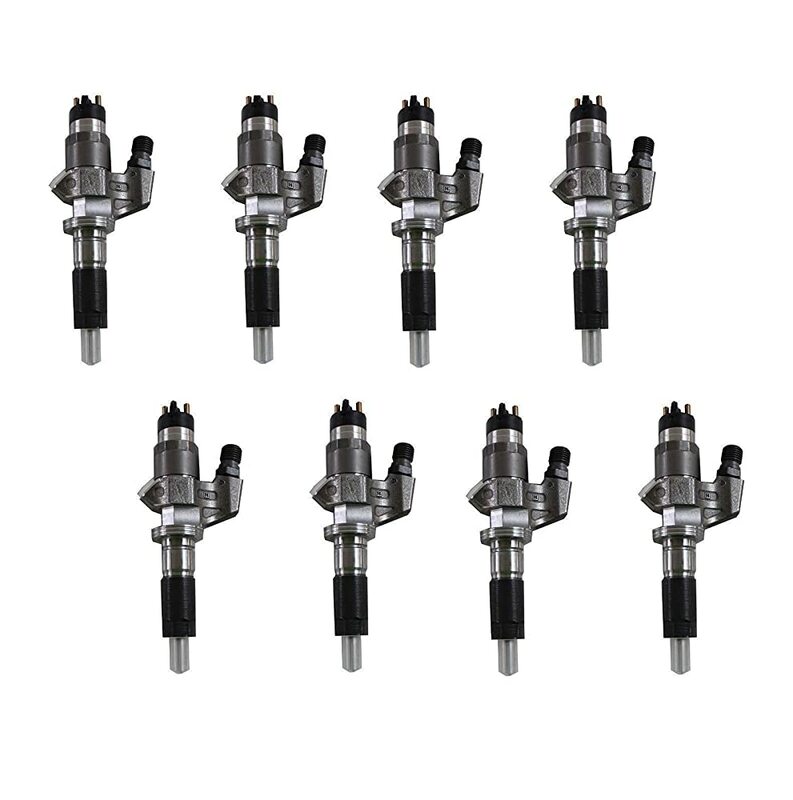 These are as close to a new stock injector as the original and are the most expensive of the re-injector category. New injectors are obviously new from the manufacturer, and their price depends on the brand and type you decide to purchase. In the end, I managed to create a nice tidy list of the top 4 best injectors of the LB7 Duramax and hope you will choose any one of these for your application. The LB7 range is remanufactured and calibrated for perfect performance. 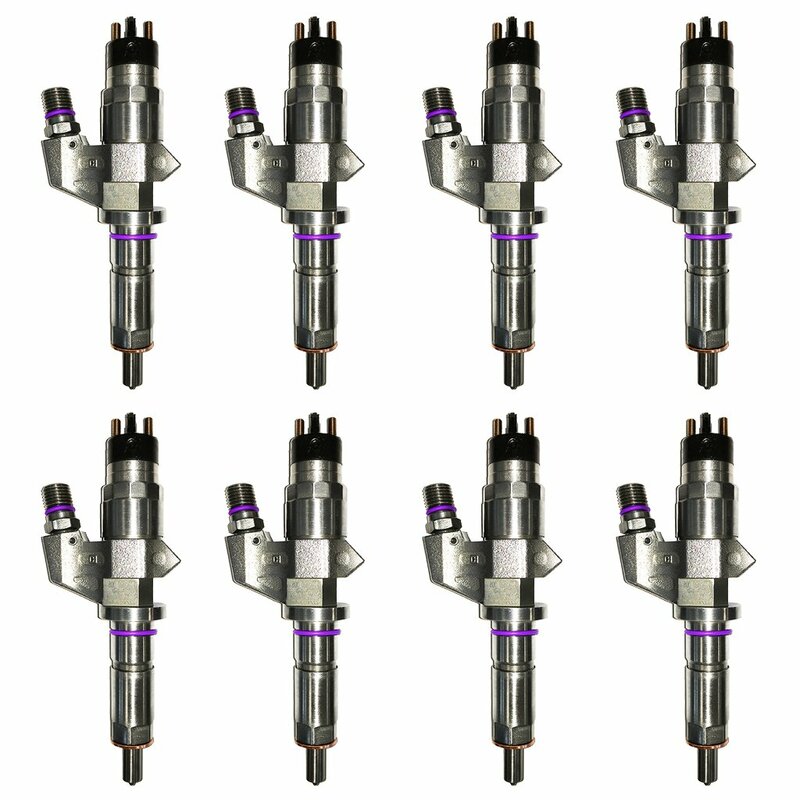 These original injectors are all original Bosch with original cores and are as exact to the OEM standard as you will get. This set of 8 comes with O-rings and copper crush washers. The Dieselogic remanufactured injector body is tested for its original integrity, and the pintle nozzle and needle valve are replaced. The leak offline is usually cleaned out thoroughly. Rather than check the springs integrity, they are replaced with a new one. This set comes with no core charge and provides around 50 RWHP over stock. Since this is a new set, it comes with the new configurations that match all models from 2001 and upwards. 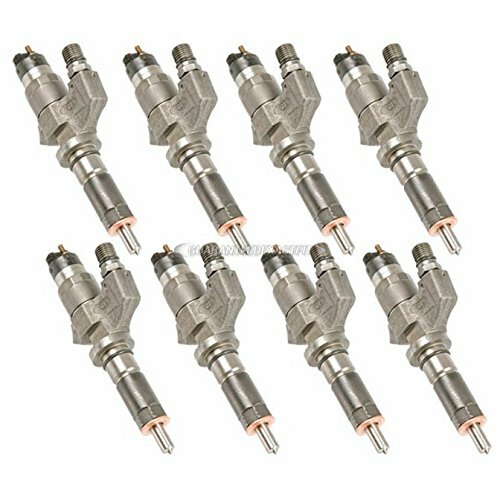 These are the remanufactured Bosch #35-81191FJ fuel injectors set of 8. The Buyautoparts remanufactured injector body retains its original integrity, and the pintle nozzle and needle valve are replaced. The leak offline is usually cleaned out thoroughly. Rather than check the springs integrity, they are replaced with a new one. The 6.6L Duramax engine was released back in 2001, and this engine is considered to be a pinnacle of diesel performance. The fact that the engine has not been unchanged only had a few upgrades made to its design is a testament to this amazing feat of engineering. Injector issues can lead to catastrophic engine problems if not diagnosed early and treated. During 2001 and 2004 the Duramax injector design was problematic, and there were many failures leading the company to redesign the original injectors from scratch. Since GM managed to make changes after 2004, a lot of vehicles from 2001 to 2004 remained an issue, and there are many motors still running on the old problematic injectors. What I suggest is that when you buy a 2001 to 2004 model, you check if it has the original injectors, if this is the case, you want to replace all of them immediately. One of the issues with the earlier models included a harness chafe of the wiring. This means that you need to replace the harness as well as the injectors. If you are an experienced mechanic or a 6.6L Duramax enthusiast then you can most probably diagnose the issues yourself, if not, here is a list of the crucial Duramax replacement issues to deal with. Find the drain valve and draining the coolant. Remove the coolant since it will flood the combustion chamber when you remove the injectors. Don’t forget to disconnect the battery when draining your coolant. Remove the neck of the coolant, the A/C condenser and the water thermostat. You might consider replacing your water thermostat too. Remove the fuel injection control module and remove the fuel injector keys. Cut and remove the fuel lines with the appropriate tool, and make sure to drain the line. Remove the valve cover, and then remove the fuel return lines. Using the appropriate tool, release the bolt from the injector hold down. Now pry the hold down pen with a prying bar and remove the injector cup. Now you can install the new injector. Fuel filter basket: This is washed and tested to make sure no debris remains to clog the pintle and seat. The EFI (Electric Fuel Injector) is calibrated using the ODBII ECU after cleaning to reach the optimum permeance indicators required by OEM specifications. Return Spring: This washed in a solution and then tested for integrity and tensile strength. Pintle: This micromachined part is replaced in most cases, but in the refurbished models is cleaned in a solution and tested for micromovement versatility. Pintle seat and cap: The seat and cap determine the spray pattern and flow rate of the diesel and as such, need to be cleaned in a solution and reset in a precise manner. The O-ring is used to insulate the seat form the heat of the engine. How much does a V8 engine cost?